Our product range includes a wide range of s.s. door aldrop kit. In tune with latest market advancement, we are offering a wide gamut of 3mm Door Kit. Our offered door kit is manufactured in line with universal quality norms using optimum quality raw material. The offered door kit is available in variety of sizes as per the numerous demands of customers. Tested on different measures set by the industry, these door kits are extensively demanded across the nation. NOTE: This products also available in kit dot, pattern in 2mm and 3 mm thickness. 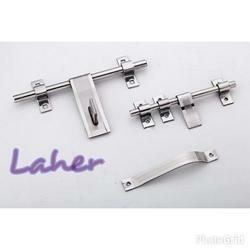 Looking for Door Fittings ?